Iowa summers can get quite hot and humid, and we definitely feel the effects here in Eldridge and the surrounding areas. Because of this, your home's air conditioning system is essential to your comfort when the weather is warm. The best way to keep it running smoothly over the years is to conduct regular AC maintenance. 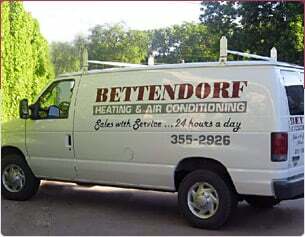 Here at Bettendorf Heating & Air Conditioning, we are proud to offer air conditioning maintenance services for homeowners and businesses in and around Eldridge, IA. Our technicians are experts in this area and have been trained in working with all of the top air conditioner brands. We work hard to keep up with ongoing education so that we can always provide the most efficient and affordable AC repair services. We recommend that you have your system serviced at least once a year to ensure that everything is working as it should. This way, we'll be able to identify any potential issues before they become major problems. Not only that, but minor repairs tend to be far less costly than major ones, so regular AC maintenance can save you a lot of money in the long run. It will also minimize the amount of time that your system is out of service, as we'll be able to complete the repairs more quickly. 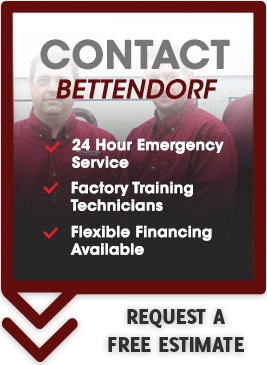 We invite you to get in touch with us right away to learn more about our air conditioning maintenance packages. When you sign up for an ongoing AC maintenance package with us, you'll get a discount on our services versus requesting the services individually. We'll be happy to answer any questions you have and help you select the most appropriate option to meet your needs. Call today to get started!